Skye, Skeabost Island Church and Churchyard. General view of effigy of knight/kilted warrior. Skye, Dunvegan, St. Mary's Old Parish Church; Trumpan Church; Gille Chriosd; Skeabost Churchyard. 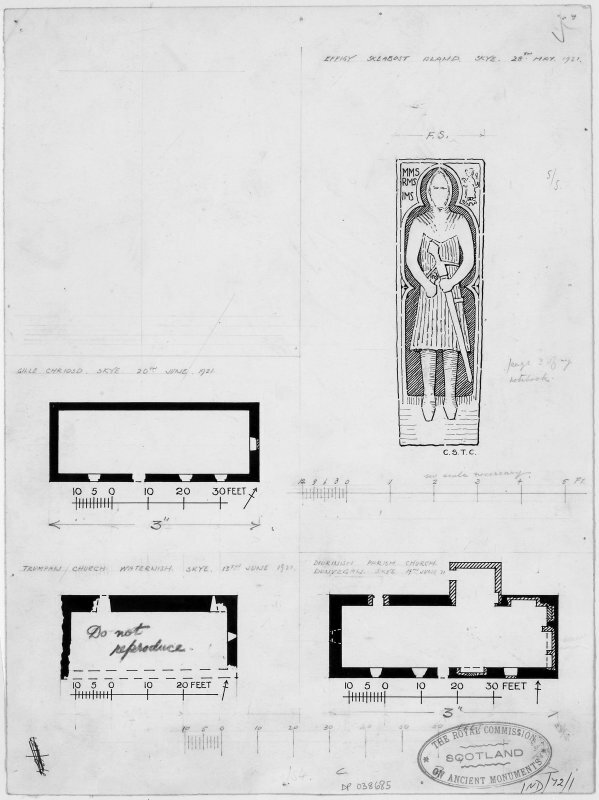 Three church plans (1":16') and sketch of effigy (1":1'4") in Skeabost Island churchyard (MacSween). 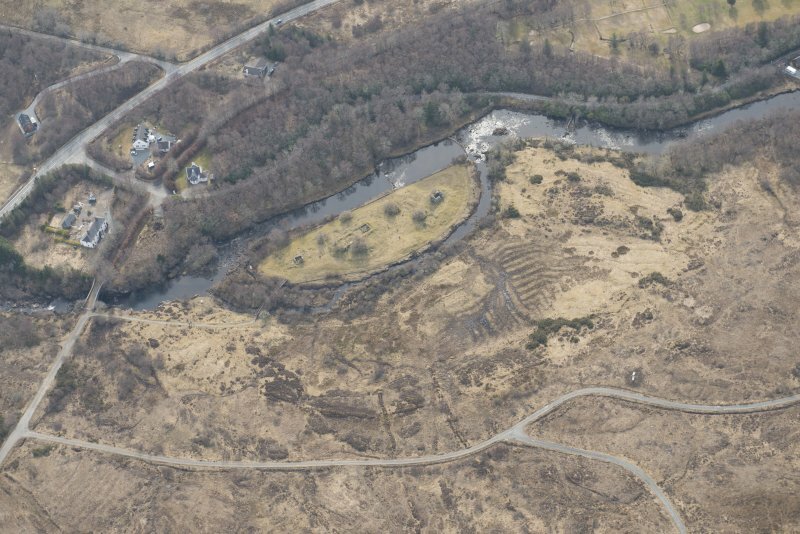 Oblique aerial view of Skeabost, Bernisdale, looking SW.
General oblique aerial view of the remains of the townships and field systems at Peinmore, Carbost and Skeabost, and the site of the possible monastic settlement on Skeabost Island, Skye, taken from the NE. Detail of grave slab of knight. 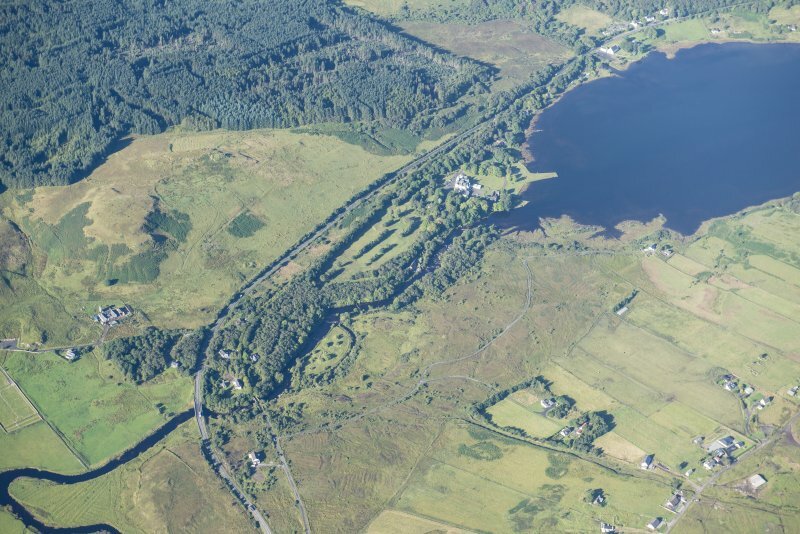 General oblique aerial view of Skeabost House Hotel and the golf course, looking WSW. Skye, Skeabost Island Church and Churchyard. General view of area. 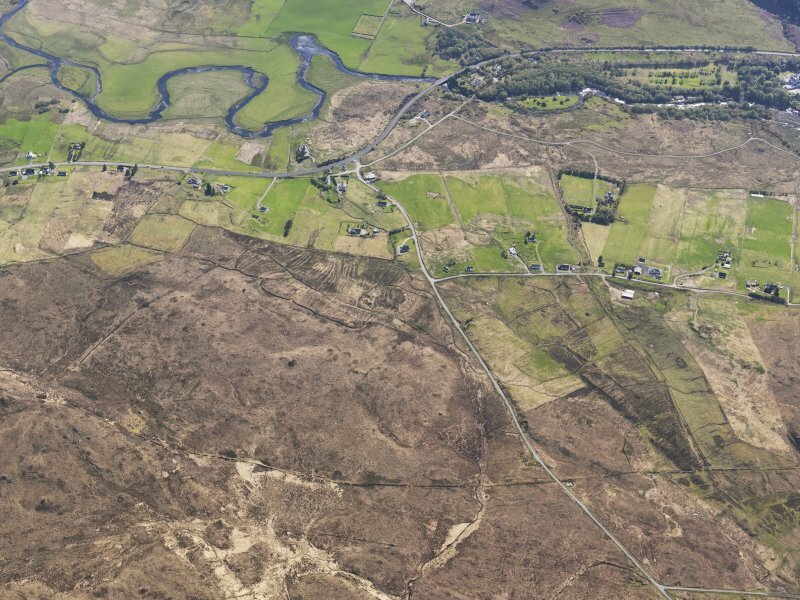 Oblique aerial view of Skeabost, Bernisdale, looking W.
Skye, Skeabost Island Church and Churchyard. 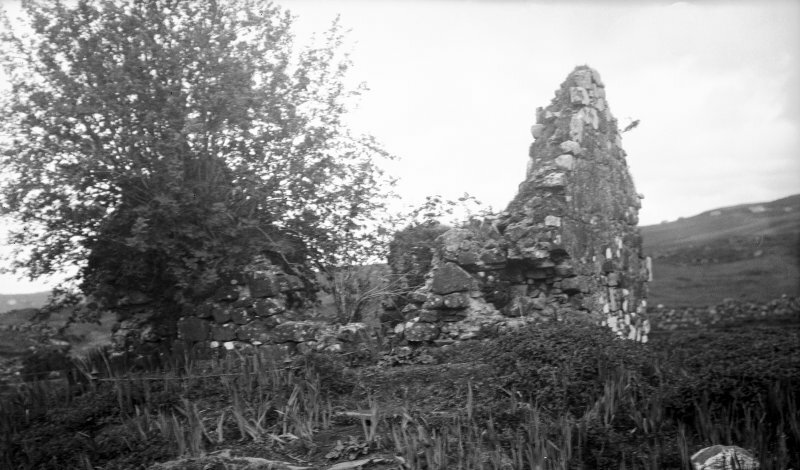 General view of ruin. 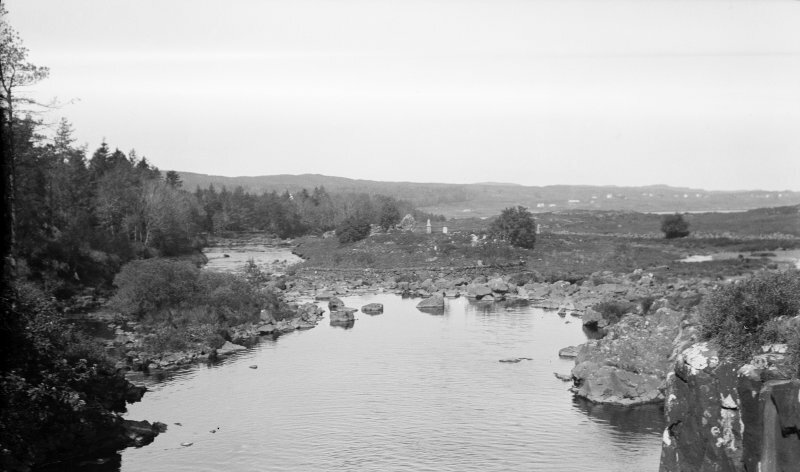 Skeabost (sheltered house) Beneath Old Skeabost Bridge (late 18th/early 19th century), the peaty waters of the Snizort wash the undulating grassy gusset of: St. Columba's Isle (Eilean Chaluim Chille). Here lie the ancient burial site and foundations of Old Snizort Parish Church, probably late medieval, which served as a cathedral church of the Bishops of the Isles, as did its predecessor. The history of this place is complicated and uncertain, requiring further archaeological research to ensure more accurate dating. To the west lies the ruin of the older but more intact Chapel/Teampall of St. Columba (also known as Nicolson's Aisle), possibly contemporary with the original 11th century Episcopal seat here, although an early 13th century date is suggested by an unearthed fragment of an ornamental nook shaft capital identical to work on Iona of that date. Tradition claims that 28 Nicolson chiefs are buried in this mortuary chapel. 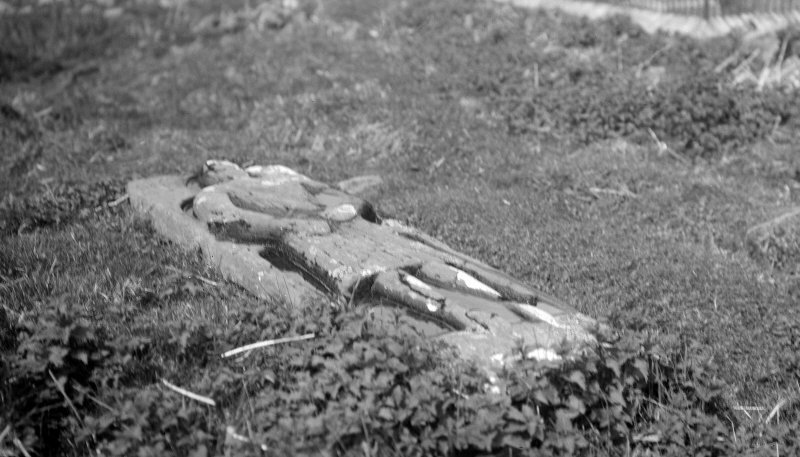 Of various important carved grave slabs found on the site, a 16th century effigy of a knight still reclines inside. Skeabost Island is occupied by a churchyard containing the ruins of two churches, one of comparatively late date, and the other a Teampull, smaller and much earlier. Both Muir (1885) and MacGibbon and Ross (1896-7), however, describe "a group of five or six chapels, the shell of two pretty entire, the others nearly reduced to the ground." 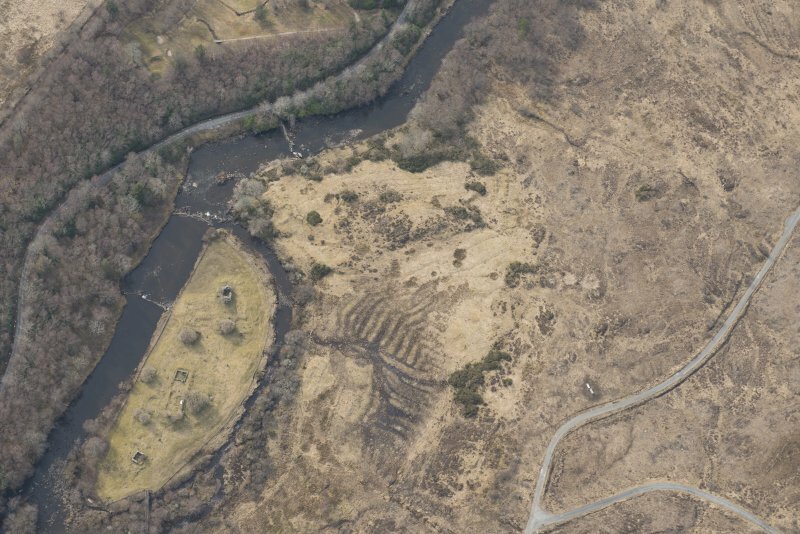 The latter continues, "fragments of an enclosing wall or rampart can also be traced," and infers that it was probably a Celtic monastic establishment. 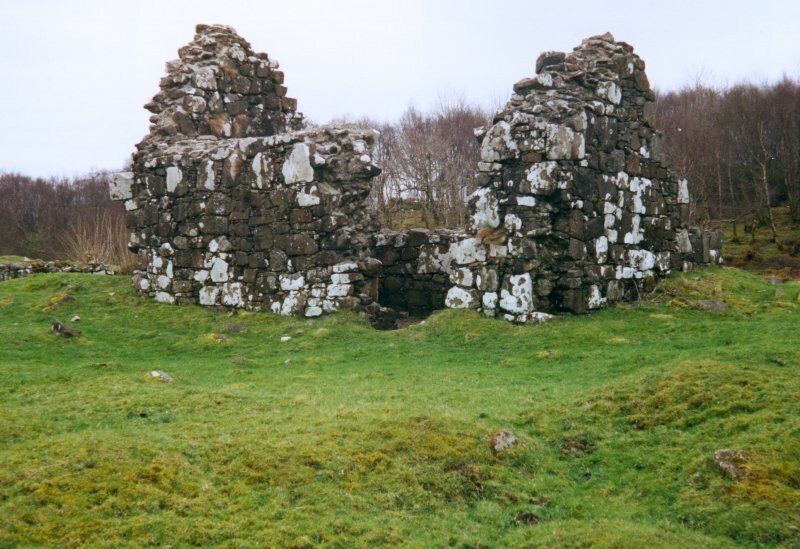 The Statistical Account of Scotland (OSA 1795) supports this, saying it was formerly "a habitation of monks and priests" and was in all probability the "metropolitan church of the whole island of Skye". The vicarage of Snizort and Raasay was received in 1526 by Sir Donald Monis. In 1561 the parsonage of Snizort pertained to the Bishop of the Isles. The teampull is in a fairly good state of preservation, the S wall being somewhat broken down. It is orientated almost due E-W and measures 15ft 10ins in length and 9ft 4ins in breadth internally, the walls of stone and lime being 2ft 8ins thick. The N wall, which is complete, stands 7ft high; the gables are about 11ft Both gables are intaken 5ins at the wall-head, indicating an early medieval not an old Celtic structure. The door is at the NW corner of the building. The church which stands almost E-W and measures externally about 79ft in length and 26ft 9ins in breadth, is now represented by grass-grown mounds. It has been encroached on by walled private burial grounds, and the only piece of building visible is on the N side near the E end. It would seem to have had a chancel. This site is associated with a Pictish symbol stone (Clach Ard - NG44NW 1), and is in all probability not to be assigned to St. Columba whose genuine foundations always bore the name Columkille (W D Simpson 1927). Statistical Account (OSA) 1795; T S Muir 1885; D MacGibbon and T Ross 1896-7; W D Simpson 1927; RCAHMS 1928. 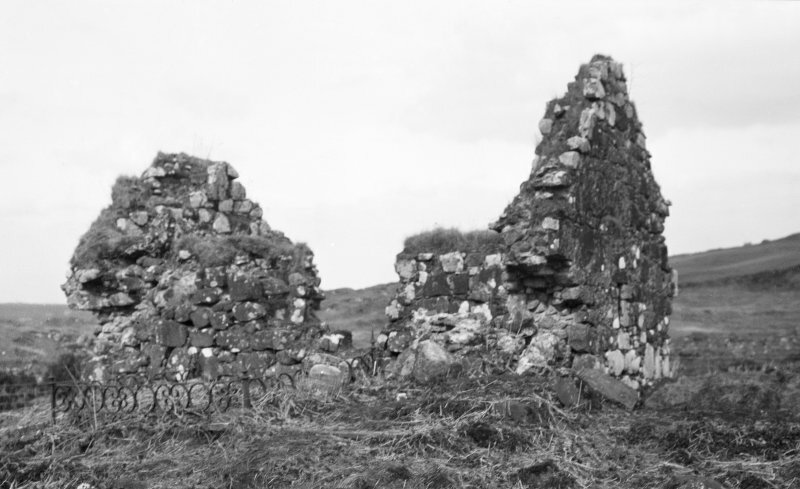 The teampull and church on Skeabost Islands are substantially as described by the RCAHMS but deterioration of the fabric has taken place since the report and the SW corner is in a very unstable condition. The whole of the churchyard is in a neglected state. Visited by OS (C F W) 11 April 1961. NG 4182 4850 A topographic survey of the bishop's seat of Skeabost Island in the River Snizort was undertaken in March 2006. There were two elements: a total station survey of the entire island and a 1:200 scale plan of the cathedral. The cathedral appears to have a S transept and there may have been structures on the exterior of the N wall of the cathedral. Interpretation of the remains of the structure of the cathedral is complicated by later burial enclosures. Although there is little visible evidence for other buildings, the mounds on which the Nicolson Aisle and the MacQueen enclosure sit (at the W and E ends of the island respectively) suggest continuity of occupation. Sponsor: the Carnegie Trust and the University of Glasgow's Faculty of Arts Graduate School Research Support Fund. 616. Church and Teampull, Skeabost Island. the ruins of two churches, one of comparatively late date and the other , the Teampull, smaller and much earlier. Church-This building, which stands almost east and west and measures externally about 79 feet in length and 26 feet 9 inches in breadth, is now represented by grass - covered mounds rising generally about 2 feet above ground near the centre of the island. It has been encroached on by walled private burying grounds, and the only piece of building visible is on the north side near the eastern end. It would seem t o have had a chancel. FONT. - A broken stone font or stoup roughly square in shape, measuring 16 inches in length by 15 inches in breadth and II inches in height , with a cavity 10 inches in diameter at the mouth and 8 inches deep , was observed in 1914 lying on the grassy mound of the western wall of the church . It cannot now be found. indicating that we have to do with an early medieval not an old Celtic structure. The door, which wants the lintel, is 3 feet wide on the outside, being splayed on either side towards the interior ; it is pl aced 4 feet 7 inches from the north-west corner of the building. There are two windows , both with inward splays. The first, in the centre of the east gab le, 2 feet 9 inches from the ground , measures 20 inches in length by 5 inches in breadth externally and 3 feet 5 inches in height an d 2 feet 3 inches in breadth internally; and the second, in the south wall, 7 feet 3 inches from the south-east corner, is broken on the western jamb. The building is mainly of polygonal stones packed with some rectangular and many small stones. The vicarage of Snizort and Raasay (" Sneisport and Rairsay " ) was received in 1526 by Sir Donald Monro, author of the Description of the Western Isles (1549).2 In 1561 " the personage of Snisport in Troutirnese " pertained to the Bishop of the Isles." The parish of Snizort till 1726 included what was then disjoined t o form the parish of Portree. 1 R eg. Sec. Sig. , 1.,No. 675. 2 Orig. Paroch., vol. ii., part i., p. 355. 3 Collecianea de Rebus Albanici s, p. 4. 7 ¾ inches in length and depressed quillons 3 ¾ inches long . The blade tapers from 2 ½ inches at the quillons to 2 inches at the point. are cut in late lettering. These are said to refer to a family named MacSween, who would have used this stone to mark their place of burial. 1 In the sinister corner is a small winged figure grasping a spear in his left hand and treading on an animal- St Michael. Near by is a slab with a figure in high relief, which is clothed in the usual quilted coat to the knees with a very high pointed bascinet and camail; the right hand clasps the belt, the left rests on the quillon of the sword. This figure is broken at the feet and is much worn by weather. 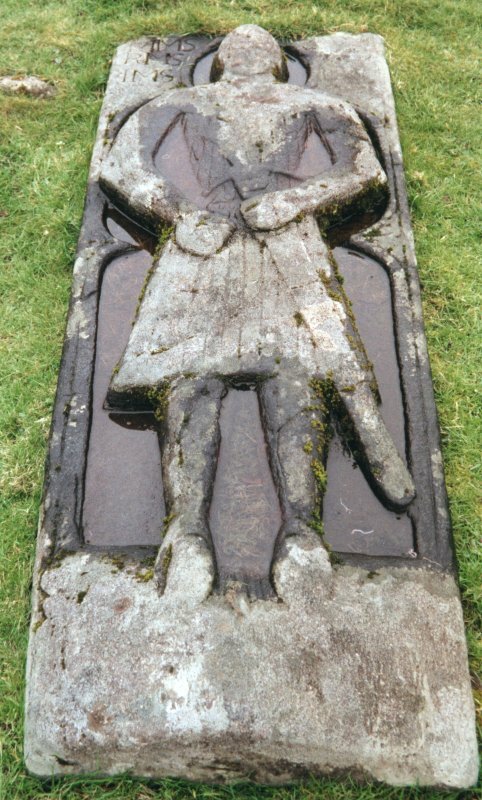 Within the church is another similar figure slab in high relief, which also is broken and badly weathered: in this case there is no quilted coat, while the claymore is grasped at the hilt by the left hand and hangs between the legs. There is said to be a fourth figured slab, but it could not be found; the churchyard is in the usual island condition of being neglected and thickly overgrown. 1 Proc. Soc. A.nt. S cot., XLIV., p. 374. Visited by RCAHMS 28 May 1921 and 25 March 1926.